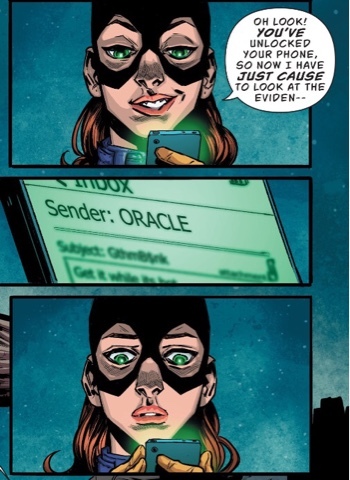 But she was Oracle! Who's despoiling her good name? Babs calls in her former Birds of of Prey partner Black Canary, but Dinah isn't convinced she's needed. The pair follow the evidence and are getting closer to, as Dinah archly puts it, 'Faux-racle', when somebody new makes the scene. I've never seen anything by TV writers Julie and Shawna Benson, but I'm impressed. While they put an awful lot of backstory and set-up in this issue, they don't fall into the old trap of telly scribes of filling the panels with words, words and more words. 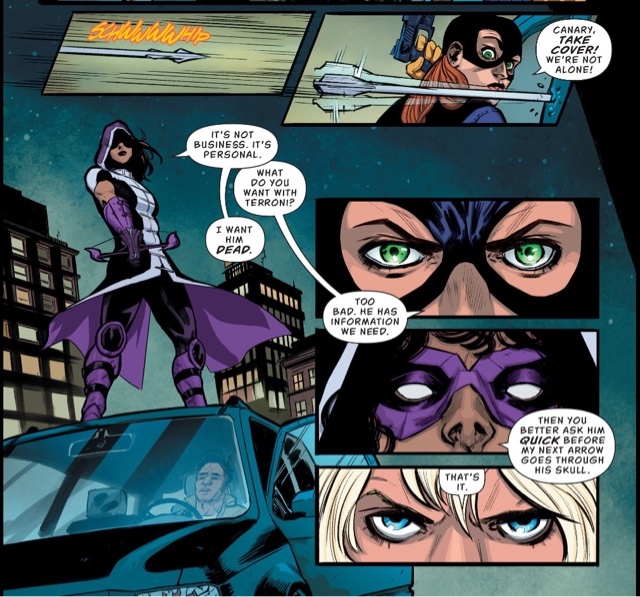 There's a good balance of words and pictures as they recap Batgirl's origin, her time as Oracle, regular team-ups with Dinah and introduce the Huntress's mission in Gotham. They trust artist Claire Roe to bear her share of the storytelling and she does them proud. Characters have heft - there's no weightlessness here, this is a DC Universe that obeys the laws of physics. 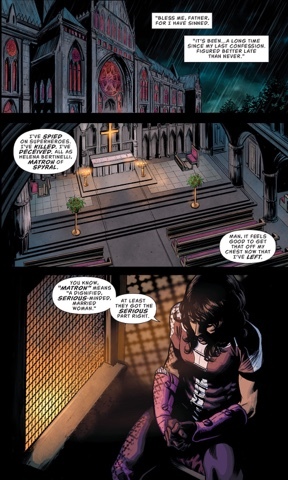 Even better, Roe has a fine sense of the dramatic, nicely shown in the Bensons' church-set introduction to Helena Bertinelli. This sharp scene also gives Allan Passalaqua a chance to show his instinct for colouring. The Bensons also capture the spiky but loving chemistry of Babs and Diana, and Roe and Passalaqua reflect this in the art. And the latter pair do a great Gotham (I'm sure I spotted the odd Scottish-style tenement from my countrywoman Roe). I'd exorcise the 'happy bird flying away in a new dawn' imagery - gorgeous as the colouring is, it's too obvious - but otherwise this is a finely judged first issue. 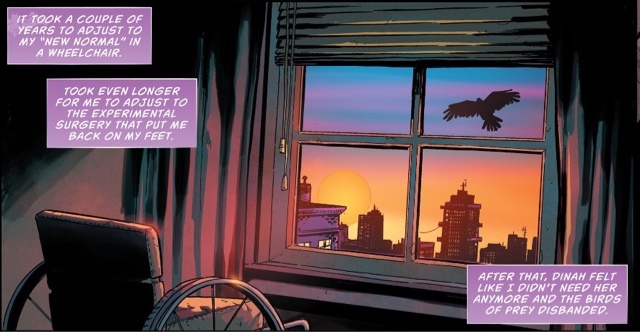 We have confirmation that The Killing Joke storyline happened and that Babs was Oracle; the New 52 Birds of Prey series seems to have been wiped away, along with the pre-Flashpoint team-ups with Huntress. I'm OK with all of this because much as I hated The Killing Joke story, it's what made Babs Oracle and the strength she showed in the aftermath of her shooting by the Joker is on display here. 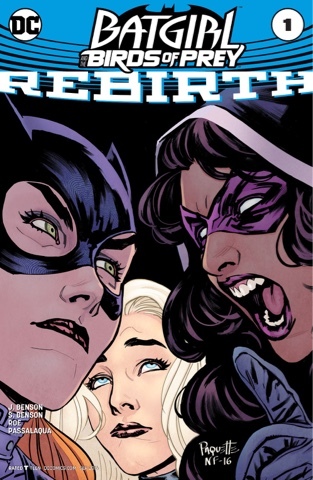 DC Rebirth covers feature many a close-up and Yanick Paquette's is a winner, previewing the character dynamics - I love Dinah's vaguely amused smirk. Ben Caldwell's variant is fun, too - it's the DC Bullet trampoline. I'm not thrilled that Babs gets top billing, BoP should be a book in which Dinah, at least, is equal partner. Hopefully that will change down the line. 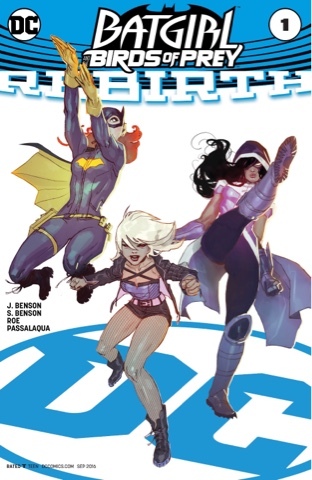 If Batgirl and the Birds of Prey delivers on the promise of this well-written, attractively drawn first issue, I'll be there to see it. I really don't like the new costume, that hood and coat are peculiar! I enjoyed this first issue more than I thought they would when the news came out that BOP was back. I think it is going to be a fun ride, watching how these three characters are handled. I believe we will know how strong this team is when we are in story arc 3 or so. I just hope each story arc isn't six issues, Hugh - let's have some zippy tales! That's pretty much rubbish - over the years people have assumed Babs was raped but that's never been canon (or imaginary canon, when the story was an Elseworlds type thing). I liked this too, I thought it did about as good of a job as could be done bridging the gap between the Nu52 storylines involving Dinah, Barbara and Huntress while leading them back to their pre-NU52 selves. Thanks again for another great review Mart! You're very welcome! I'm enjoying Rebirth so very much. I like what I've seen here. (Which is almost all of the issue, but my train pulled in before I got the the last few pages). And whether or not they've wiped out the New 52 Birds of Prey, I hope they bring Staling back somehow. She was a pip. I jumped off the last series before seeing what happens to her, I have a vague memory of reading that she'd betrayed folk, is that so? I jumped off before then, too, but that was my impression. I think she was working for Mr. Freeze? But certainly worse things have been explained away in the name of character rehabilitation. love the review! love BOP! I wonder though how they explained Helena being a dark skinned Italian woman now, since by Rebirth logic they are still the same pre-52 characters with just memory problems? Sssh Willy, we can't ask that kind of thing! I'm glad you're enjoying this new series too.